After introducing a refresh to the MacBook Air and MacBook Pro ranges – bereft of the expected Retina display – Apple came through by showcasing it’s brand new model, which is essentially an amalgam of both popular notebooks with a few added extras thrown in for good measure. At 0.71 inches, it’s almost as thin as the revolutionary MacBook Air, and at just under 4.5lbs, it’s extremely light. The 15.4-inch display follows the precedent set by the iPhone 4/4S and the third-gen iPad by packing in an incredible amount of pixels, equating to what Apple describes as the “Retina display,” and at 2880×1800, it blows any other notebook out of the water in terms of pixel density. As well as the screen, which will be enough to leave the majority of MacBook fans foaming at the mouth, it boasts quad core CPU i5 or i7, up to 16GB of RAM, and can offer the power users up to 768GB of flash storage. It packs in NVIDIA GeForce GT 650m graphics, and despite the sleuth of hardware upgrades, still manages to hold battery for 7 hours, which is astonishing. It includes USB 3.0, Thunderbolt, as well as the usual connectors, and I have to say, it looks to be a game-changing piece of kit. The ultrabook market has done a pretty poor job of competing with the MacBook Air hitherto, and if you ever had reservations regarding a MacBook purchase, they surely will have been dispelled by this announcement. 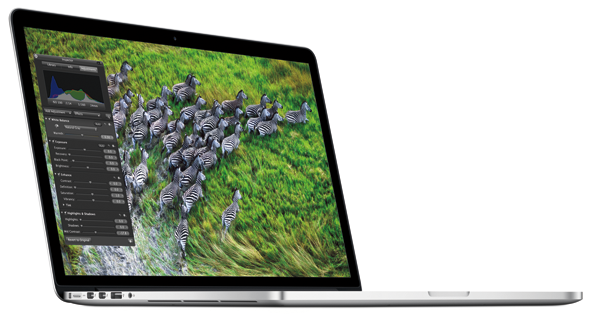 Although the MacBook Pro and Air received handsome upgrades, I cannot see how consumers will be able to opt for the older models over the slick powerhouse that is the next-gen MacBook Pro. at $2199, price could wind up being a factor for many, but with so many advantages over both the regular Pro and Air, it’s worth saving up for. After seeing Apple unleash the hardware with the third iPad, Tim Cook’s company certainly isn’t doing things by halves in 2012, rendering the prospect of the next iPhone later this year just that little bit more exciting. And here comes the surprising bit, it’s available today.